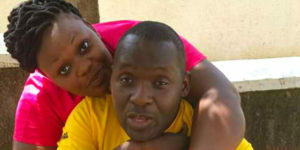 Catherine Kusasira and her husband Fred Sseruga. Photo by Paul Ibanda. Catherine Kusasira is a band musician and a member of Golden production. She has done many songs with some featuring her husband and majority being love ballads. She is a wife to fellow Band singer Fred Sseruga, one of the pioneers of Golden production. Being one of the leading band female musicians in the industry, Kusasira is never settled in one place because of her busy schedule. The couple talked to PAUL IBANDA on how they have managed to overcome all the challenges faced in their relationship. Nice scents, have you just boarded off a plane from the USA? Not true. I have been in the country but any organized lady must have or use good smelling perfumes. What is new on your side that you would like to share with us and fans today? So should we say that you are eying a political office? Why do you ever keep your hair short yet it is believed that it’s a woman’s pride and source of respect? Personally, I am not interested in having long hair. I feel more comfortable with this size and kind of hair. Ever smiling, what can make you keep off your smile? My smile is natural in a way that even if I am angry still it will feature my face. Very stable and everything is just good. How many children do you have in your relationship? Currently I have two but I plan to add more two to make it four and I bid fare well to the labour ward. Are you planning to have the four children in Sseruga alone or planning to do it the way majority of female musicians do? I hate that policy of every child with a different father. I have never thought of stepping out of my relationship. And no one should think of it because I am a determined wife. And why is your relationship always on and off? The relationship has never been unstable. But the problem is that we are celebrities. So every simple or minor mistake we do as a couple and information leaks out to the media, the public is misinformed upon what is trending in our relationship and such information is hurriedly taken up by the audience. But in most cases, these are minor issues that almost happen to every relationship. But you once separated and shifted to Bombo, what prompted you to make a U- turn? Honestly where there are misunderstandings, it is advisable that you give your partner a break to refresh up both mentally and physically. It has been due to such circumstances that we create space between ourselves as a way of resolving back the relationship. Unfortunately, media has done much in blackmailing our family affairs. Before blaming the media, don’t you have a clear ground for keeping family issues secret? We have and we always do it but sometimes we just find information about our affairs circulating in the media. Well, now that you are back and settled in your relationship, what would force you step out of it again? If my husband Sseruga gets a side dish and I get to know of it, automatically the relationship will come to an end. And why would you terminate the relationship. Don’t you believe in sharing men as a way of enabling every lady get access to a husband? And why do men hate sharing women since we are many? For how long have you been together? And why are you not putting on your wedding ring? We have not made it officially but sooner than later, all things will be sorted out amicably and we shall invite you as media personalities, fans and well-wishers. What is your worst experience in your relationship? The day I had abandoned my relationship not knowing that what had made me step out of it was clear propaganda circulating in the media? And your best experience or moment. The day my husband kneeled down and said, “am sorry darling”, please forgive me. Truly I felt never the same. Do you always sing for others or sing about your relationship only? Sometimes we compose songs reflecting our relationship and in the process become part of other people’s love life. But generally, we sing about what we hear, see and experience. When do you attend to your children as parents amid your busy schedule? We leave at different hours. But personally most of my day time is too fixed but by 7:00 pm am always free and ever there for them. To the husband, he is sometimes free during day time. Generally it is all about having a time table for the cores. What hurts much in relationships? Telling me lies and doing excessive or deeper investigations about me. As celebrities, do you believe in sharing top secrets in your relationship? Yes because we are meant to share everything as a sign of conjoint understanding. Besides music, how do you spend your free time? Am always attending to my Garment shop called Kusaasira Beauty solutions on Access building along Rubaga road. Money or Relationships, what do you consider first? When was your last visit to church for prayers? We pray every Sunday as a family. We are Christians. Currently am satisfied with my Prado. To all couples, patience is important in relationships and successful couples all endure with patience. Relationships are not about enjoying good life. Therefore they shouldn’t step out of their affairs because they are not enjoying their dream economies.